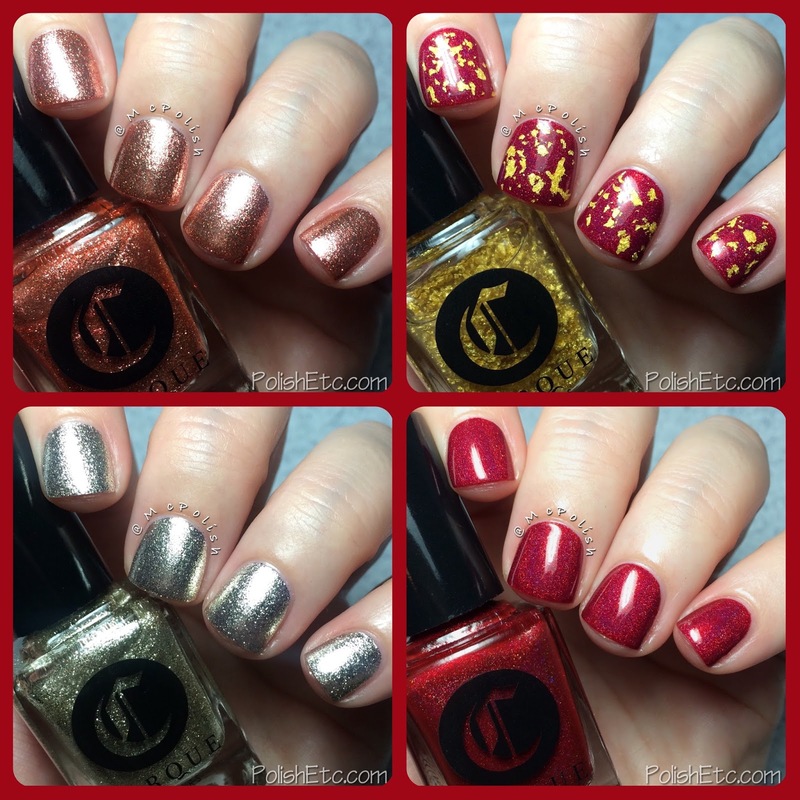 Cirque Colors - Holiday 2015 Collection - Polish Etc. 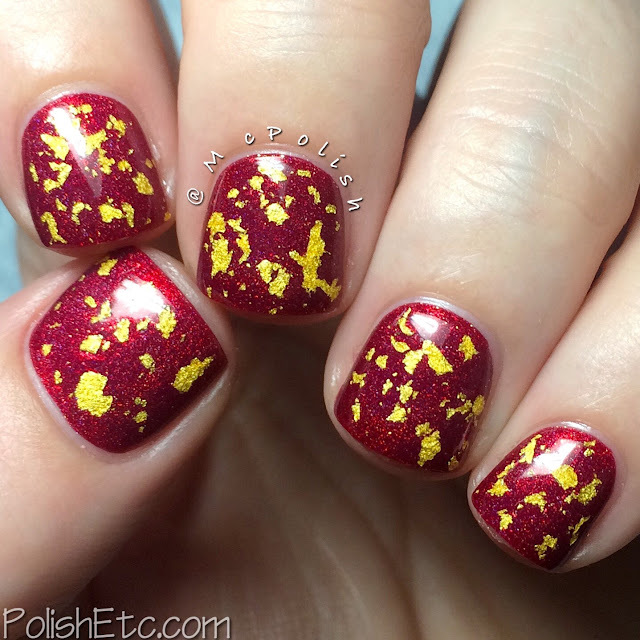 Today, I have some super special polishes to share with you. Everyone loves Cirque Colors, right? They always have the coolest colors and the smoothest application. Well, their holiday collection this year is no exception. It is small but it is mighty. There are only four polishes in this collection. One will be a permanent shade, two are limited edition and one is a return of a classic holiday topper. I have all four to share with you today and just a warning, this will be a picture heavy post. The two super reflective polishes in this set are so difficult to photograph, I included several different shots of them both. So let's get into the blingy goodness! "Madder" is the only permanent shade in the collection. 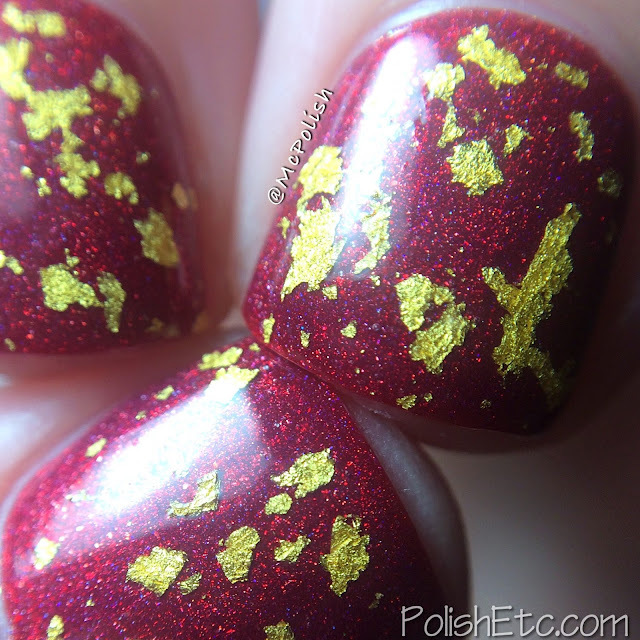 It is a deep cherry red with a subtle linear holographic shimmer running throughout it. There also appears to be a little bit of a blue flash at certain angles. This polish is a perfect addition to the Cirque Colors holographic line for Christmas. The formula was scrumptious and applied like butter. I did two easy coats with a glossy top coat for these swatches. 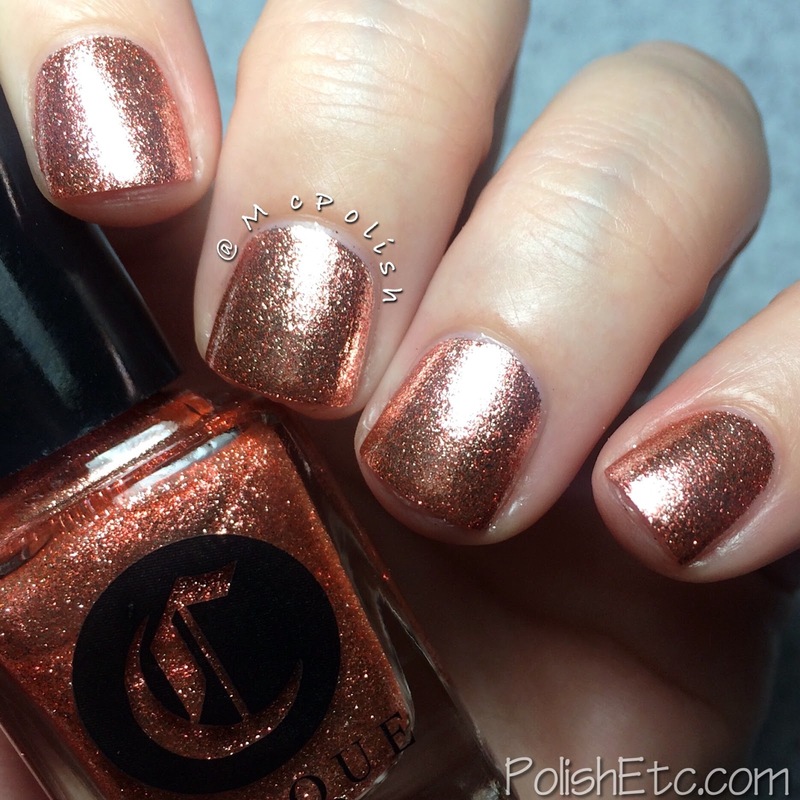 "Au" is luxurious polish that Cirque Colors only brings out for the holidays. This is a 23k real gold leaf flake topper. The base is clear and the flake payoff is fantastic. You do not need to fish around for the gold leaf and get a good amount on your brush for one coat. I have other gold leaf toppers and they are not as smooth to apply as this one. You would think that the gold would be bumpy and stick up on the nail. But it is like fluffy angel kisses and just melt onto the nail. Haha! No, but seriously, this topper applies so smoothly. I love it. For these photos, I used one coat of Au over Madder topped with a glossy top coat. This polish is expensive at $36 a bottle. But it's real gold in there and gold is pricey. I was gifted this bottle last year by my bestie-boo, Amy (Indie500nails) and was not sent it for review from Cirque. But it is part of the Holiday 2015 Collection this year. Grab it while you can! "Reflektor" is the perfect nail for this silver platinum microflakie polish. You will have mirrors on your nails. I cannot believe how reflective this polish is! It was very heard to get an accurate photo of this polish as it just kept sending beams of light reflecting off of my nails. I wore this as a full mani during my vacation this Thanksgiving and had strangers stop me to ask me about my nails. No lie. Reflektor is made up of tiny pure silver coated microflakies in clear base. In real life the color is more platinum and leans slightly more gold than just a plain silver. Two coats and it is fully opaque on the nail. None of the flakies stick up, they all lie flat against the nail. These photos are taken under a bright light but the last macro shot is with the light behind my hand. This "shade" shot really shows off the reflectiveness of this polish. You can clearly see the image of my white macro lens bouncing off of the silver flakes. "Halcyon" is the other super reflective polish in this collection. It is just the same as I described for Reflektor but the pure silver plated microflakies are a mix of silver and rose gold. Ermahgerd! This polish is amazing! 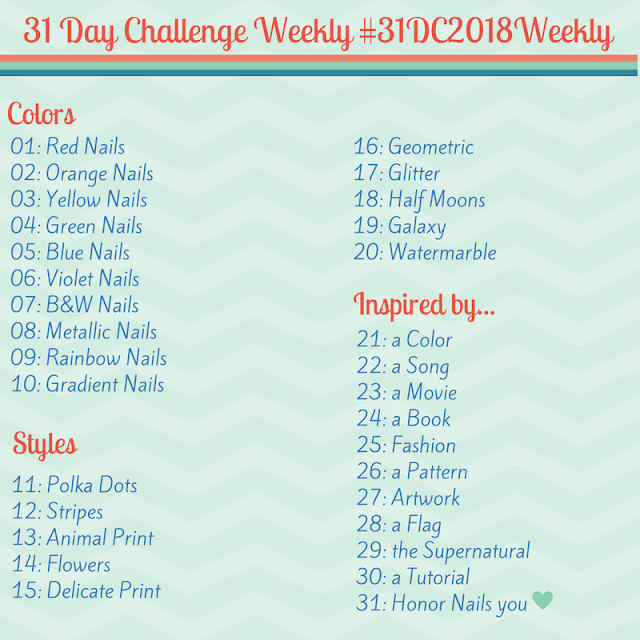 Again, I wore this out as a full mani for two days and got some many comments and questions about my nails. Same formula, opaque in two coats. The last macro photo was taken in the same fashion to show off the reflectiveness in the "shade." I'm in love with this one. The Cirque Colors Holiday 2015 Collection is available now. Au, Reflektor and Halcyon are all limited edition and will not be around for long. Currently, Reflektor and Halcyon are sold out but are being restocked this week. You can sign up via email on each of these polishes pages to be alerted when the restock goes live. I would advise to go ahead and sign up because these babies are going to go fast. And you need them. The other fantastic perk of this holiday collection is that 10% of the net proceeds from the sale of each of the polishes in the collection will be donated to Girl Who Code. This is a non-profit organization that works to empower young girls to pursue opportunities in STEM (science, technology, engineering and math) fields. As a science nerd myself, I fully support and encourage girls to become more familiar with these areas of science. This pledge will only be going on until December 31st. So be sure to get your order in before the end of the year to support this amazing organization. Here is where you can get your Cirque Colors fix! Beautiful swatches! Halcyon is my favorite. It's really similar to ILNP's Juliette except there's no holographic and the flakes are smaller.